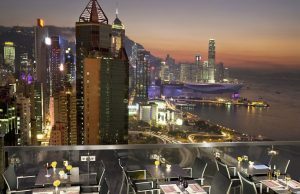 Hong Kong (Hong Kong SAR) – May 13, 2017 (travelindex.com) – The Excelsior, Hong Kong has unveiled its newly re-designed Excelsior Suite. Drawing inspiration from its 270-degree harbour view, the suite’s new interiors capture the essence of the Pearl of the Orient. Guests can enjoy the stylishly redecorated suite and a host of other benefits when booking the hotel’s So Suite! package. A comfortable and relaxing space, the 1,380 square foot Excelsior Suite has a master bedroom with walk-in closet, living room with dining area and an open-plan kitchen. By adding two adjacent one bedroom suites, a total of 1,970 square foot of space becomes available, making the Excelsior Suite ideal for families. Guests enter the suite through a spacious living area that has a blue gradient carpet inspired by the tranquil sea, which can be seen from the windows. This view can be enjoyed from the bright orange, V-shaped window sofa, which makes a cosy spot for watching the sun set over the harbour. Soothing natural colours dominate the living room, which has a 65-inch LED TV, BOSE speakers and a Blu-ray player. Furnished with a classic Kalmar Werkstätten rosewood pendant lamp, the room’s dining space has a marble dining table with seating for six and feature wall covered with Fromental silk wallpaper. The open plan kitchen is equipped with Fulgor Milano oven and induction cooktop, De’Longhi kettle and toaster, collection of Cristel cookware, and Nespresso coffee machine. The understated oak-white wall coverings found in the living and dining area continue in the master bedroom. Another orange window sofa next to the bedroom entrance adds a bright ‘pop’ of colour to the room. An adjacent sofa takes in views of the city skyline and glittering harbour, and is complemented by an artistically crafted triangular coffee table. Two bedside lamps of different heights and shapes add asymmetrical elegance to the bedroom, which has a 42-inch LED television with over 46 cable and satellite channels, and BOSE SoundLink Mini Speaker with Bluetooth connectivity. The master bedroom’s spacious walk-in closet has a three-panel full-length mirror, and the dressing table is fitted with a backlit three-panel mirror. The master bedroom’s marble bathroom has twin basins and Kaldewei soaking bathtub. A separate walk-in shower is equipped with anti-fog mirror and rainforest showerhead. The Suite comes with Mandarin Tea bath products by Shanghai Tang. “We are delighted to debut the newly renovated Excelsior Suite, a signature of this time-honoured hotel,” said Jan-Hendrik Meidinger, General Manager of The Excelsior, Hong Kong, “We look forward to welcoming guests to its comfortable interiors, and hope they will enjoy the superlative service that the hotel is renowned for”. Causeway Bay is home to the Noon Day Gun, Victoria Park, Royal Hong Kong Yacht Club and other city landmarks. Luxury goods retailers at Sogo Department Store, Times Square and Hysan Place, along with affordable boutiques in several local shopping malls, are only a stroll away from The Excelsior, Hong Kong. Situated in the heart of Causeway Bay, the shopping centre of Hong Kong Island, The Excelsior, Hong Kong is only a five-minute drive from the city’s central business district and 40 minutes by MTR from Hong Kong International Airport. The hotel features exclusive Executive Floors, with a private lounge, fully equipped business centre, state-of-the-art Fitness Centre offering advanced fitness equipment and dedicated spa facilities, and extensive meeting and banquet facilities.